Remember Jurassic Park...Not the part where everyone is running for their lives, but the scene when they first see the Dinosaurs roaming around. Well now, thanks to the Bronx Zoo you too can you have your own Jurassic experience. 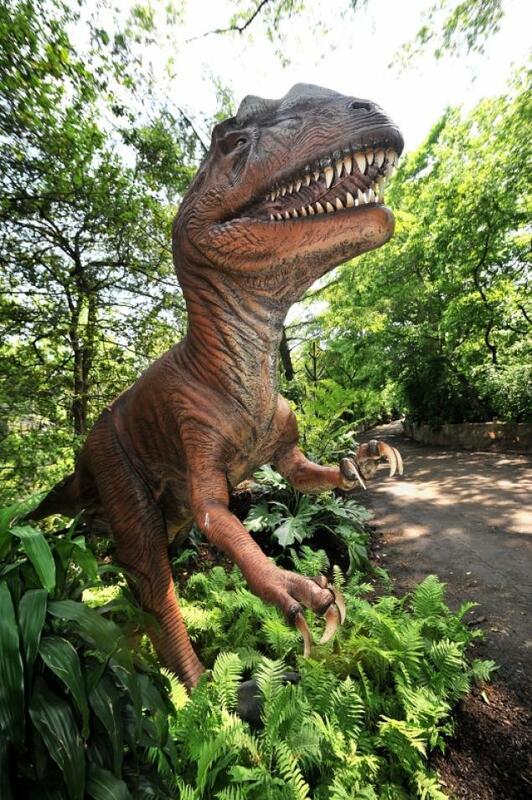 Beginning today May 25 through September 8th visitors to the Bronx Zoo can go back 300 million years.The exhibit includes more than 20 life-like animatronic dinosaurs up to 40 feet long which snarl, roar and spit. The narrated ride runs through a two-acre area of the zoo and highlights some of the similar physical and behavioral adaptations many prehistoric species share with modern-day wildlife. A guide helps identify the dinosaurs and explains how animals at the Bronx Zoo use similar adaptations to survive in the wild. Dinosaur Safari begins with the Permian period which began about 300 million years ago and concludes about 20 minutes later with the Cretaceous period which ended 65 million years ago. Each dinosaur encountered moves and vocalizes. At the end of the experience, there is a fossil dig for children; a Tyrannosaurus rex photo-op; a paleontologist’s tent where fossil replicas will be on display; and an interactive Stegosaurus that shows how the dinosaur animatronics work.